Wind damage is one of the most common roofing problems, and chances are, your roof may already have sustained damage in the past few years. How can you check for wind damage, however, before calling a roofer to fix it? Here are signs that indicate your roof has experienced wind damage. 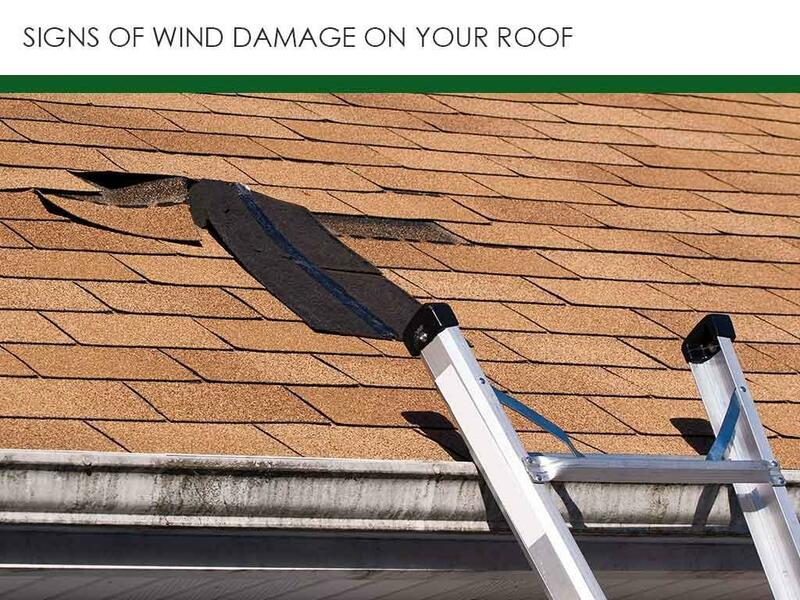 Wind damage can be different from most kinds of roofing damage in that it’s not preceded by events like a storm, a sudden bout of hail, or a falling tree. The signs are less noticeable, and homeowners often go about their daily activities not noticing the damage until the roof requires major repair work. The signs may be less noticeable, but they’re not invisible. By keeping an eye on your roof’s condition, you can minimize and even avoid unplanned repair costs. With a pair of binoculars, start your inspection with the roof’s edge; the first row of shingles are called starter strips, which, on most modern roofing systems, are installed using a combination of adhesive and nails. This first row should be perfectly flat; otherwise, you may be looking at signs of wind damage. Next, inspect the shingles themselves and look for creases, which resemble thin horizontal lines where the granules have been worn off and would look like as if the shingles were folded and then put back. Properly-installed shingles should not have this problem, so improper installation can also be a factor. And finally, all shingles should be present and accounted for; missing shingles are an obvious sign that your roof has been hit by strong winds. So, let’s say you found these signs on your roof. This means you should fix them as soon as possible. The first thing you should check is your roofing warranty as most modern roofing systems have some sort of warranty coverage against high winds. For instance, most GAF Lifetime Roofing Systems have coverage for up to 130 mph wind speeds. So, if you’re covered by your warranty, we recommend getting in touch with the contractor who installed your roof. If your roof will require out-of-warranty repairs or is up for replacement anyway, we recommend working with a roofer certified by major roofing companies. Ultimately, you know you will be getting a better, windproof roof. We hold certifications from leading roofing companies, such as GAF, CertainTeed®, IKO® and Owens Corning®. To learn more about why professional roof repair and maintenance are important, fill out our contact form today. We serve many areas in and around Federal Way, GA.